On the 18th of June in 1935 Dr. Alfred ‘Fred’ Jolliffe and 14 young assistants, all undergraduate students from western universities, arrived in Yellowknife Bay (map). Jolliffe had been hired by the Geological Survey of Canada to map the geology of almost 20,000 square kilometres on the north side of Great Slave Lake. Geologic maps of this area were needed to assist the hundreds of prospectors who had flooded into the area looking for gold. Small amounts of gold were discovered on the north side of Great Slave Lake in the late 1890s but wasn’t until the late 1920s that prospecting really began to take off. Some early claims in the Yellowknife Bay area were made in 1928 by Dr. Mackintosh Bell, but these weren’t considered rich enough to be mined. A few years later word of gold discoveries made by Johnny Baker on the east side of Yellowknife Bay brought in hundreds of prospectors and Fred Jolliffe and his fourteen assistants. It was on the long trip north from Edmonton that Jolliffe gave his assistants a ‘crash course’ in geological mapping methods. One of the student’s major concerns was what to do if they found gold! Fred Jolliffe explained that it was the policy of the Geological Survey of Canada to share any information they were gathering with any prospectors who asked, even if the survey was still in progress. He went on to assured them that they would not find gold because they would be far too busy mapping to do any prospecting. Throughout July and August of 1935 Jolliffe’s assistants to surveyed much of the north side of Great Slave Lake and were preparing, in mid September, to head back south when there base camp was visited by three experienced prospectors, Vic Stevens, Don MacLaren and Ed McLellan. These men asked to look at some of the preliminary geologic maps and then asked Fred Jolliffe if he could recommend any promising areas for them to conduct one last prospecting trip before freeze up. One of Jolliffe’s students, Norman Jennejohn, had been working in an area on the south-west side of Yellowknife Bay and had come up with what were considered to be the right conditions under which gold might be found. Jolliffe told the Stevens party about this area and they rushed off to check it out. The Stevens party accompanied Jennejohn on his last traverse of the season when Jennejohn picked up a piece of quartz that everyone could plainly see contained gold. As an employee of the Geological Survey Jennejohn wasn’t allowed to stake a claim for the gold he had discovered. While Jennejohn remained behind to finish his work the Stevens party returned to the base camp, told Fred Jolliffe about their discovery and asked him to not tell any other prospectors. Jolliffe agreed to keep the secret for a short while to allow the Stevens party to finish their staking but a few days later Jolliffe learned that it was actually Norman Jennejohn who had made the discovery! Geological Survey policy was quite clear on this issue, if an employee makes a discovery then every one must be informed in a fair manner and that’s what Fred Jolliffe did. On the 20th of September in 1935 he called a meeting of all the prospectors in the area and told them of Jennejohn’s discovery. 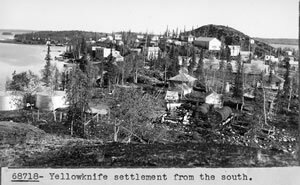 Present at this meeting were a group of prospectors working for Cominco and they rushed into the area and claimed the richest part of the find, a find that eventually became Yellowknife’s Con Mine.